What do you make when you've only got about 10 - minutes to whip something up? The answer is usually pasta, and this is one of the quickest ones I know of. Granted, it's nothing spectacular, but it's simple and tasty. And let's face it, on most weeknights, that's all you want. 1. Bring a pot of salted water to the boil, add spaghetti and cook 7 - 10 minutes, or until al dente. 2. In a seperate pan, cook the peas for about 4 minutes few minutes, then add salmon, dill pickles, buttermilk and yoghurt. Stir gently to combine, add dill and season with salt & pepper. Cook for about 5 minutes over low heat to allow the flavours to mingle. 3. Drain the pasta, reserving 1/4 cup of the cooking liquid. 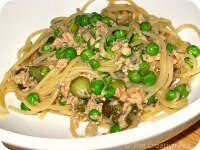 Drizzle with olive oil and then toss with salmon and peas. Add reserved water to loosen. Serve immediately. I see nothing wrong with this meal...it is healthy, easy and fast. Just what I need right now!! Thanks Nina. Sometimes simplest is best. I wish I had seen this before I made supper last night, I had no time and nothing in the fridge, I could have made this and it would have been much better.